Kathryn and I first met Emma and Carla when we were attending a business entrepreneurs’ event in the Philippines. Meeting these two vivacious and fun loving entrepreneurs made a mark on both of us. Their joy of life was infectious, and we wanted to know more about them, their journey and what they did. Emma and Carla Papas, known as ‘The Merrymaker Sisters’ are real life sisters who went from being communication professionals to health and happiness advocates and health coaches! They’re the founders of themerrymakersisters.com where they inspire hundreds of thousands of Merrymakers around the world with real food recipes and ways to find and follow your bliss! 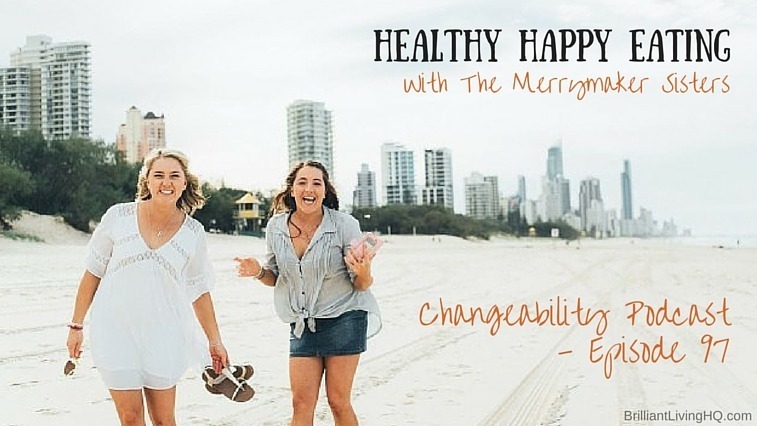 So, what better than to invite them onto episode 97 of The Changeability Podcast laugh and chat healthy happy eating with The Merrymaker Sisters. Emma and Carla’s inspirational story from food obsessive mindsets to health and wellbeing. Find out what it means to be a ‘merrymaker’ and what it hopefully doesn’t mean! What on earth does Carla and Emma mean when they say ‘follow your bliss’ and why you should consider it? Why you are a hero of your own journey. Where to start with healthier, happier, eating habits. What makes healthy, happy food? The effects of mindful eating. Foods to give up and what we should we have more of. Why we need to be free of gluten, dairy and refined sugars. What gets in the way or stops you eating healthily, even when you want to? Suggestions for healthier sweet snack options when you get the munchies in the evening. And more laughter and giggling you can cram into a podcast show than is good for you. Plus, don’t miss my blooper at the end of today’s show! Emma and Carla’s on Instagram – warning: don’t look at this when you’re hungry; it’s yummy-lichiously addictive!